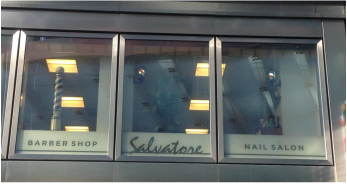 Click on the image above for a virtual 360° tour of Salvatore Barber Salon. We also offer hair styling and blow dry services for women. Walk-ins are always welcome or you can call us at ﻿646-769-4272﻿ to schedule an appointment. Get directions and public transportation options. Would You Spend $800 for a Haircut? We're located on the atrium level of the Conrad Hotel, just down the hall from the fitness center. The Conrad is adjacent to the Goldman Sachs building in lower Manhattan.